Considering a career chasing volcanoes around the globe? Make sure you have all the skills you need to strengthen that CV! 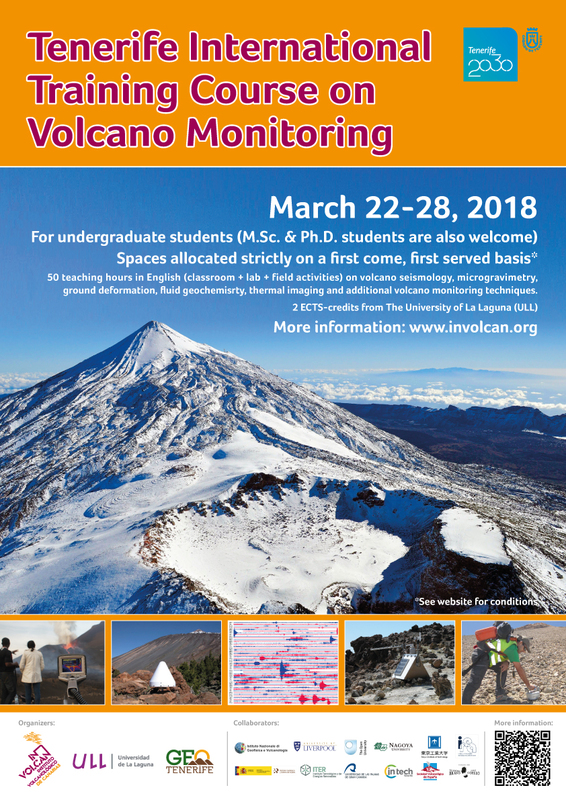 GeoTenerife is delighted to co-organise this week-long volcano monitoring training course with the Canary Island Volcanology Institute (INVOLCAN) and the University of La Laguna. There are a maximum of 40 places available, which will be granted on a first come, first served basis. The course is aimed primarily at earth science undergraduate students, but recent graduates are also welcome to apply. The week will include 50 teaching hours and participants will earn 2 ECTS from La Laguna University. All teaching and materials will be in English. The aim of this course is to introduce students to the subject of Volcano Monitoring “hands on” by alternating lectures with practical laboratory and field activities. Lessons will be given by researchers having an international scientific background and first-hand experience on Volcano Monitoring. Two field trips will be done at Teide volcano and Las Cañadas caldera and to outcrops of volcanic successions all around the island. The prerequisites for attending this course are basic skills in Earth Sciences, as well as basic knowledge of Mathematics, Physics and Chemistry. This course is an opportunity for you to learn a range of skills and techniques that are fully transferable to the workplace. The course runs from 22-28 March. Students from abroad are asked to arrive in Tenerife on 21 March ready for a 9am start the next day. The course finishes at 18:00 on 28th March – students are welcome to stay on that night or fly home after that time on the 28th. No refund will be made if you do not stay the extra night in the hotel. Please note that check out from the hotel is after breakfast, no later than 10am on 29th March. The week-long course costs €650 (EUROS) per student. – Transfers to/from the hotel and the airport on arrival and departure. You can fly to either of the two airports in Tenerife – both are well connected by bus or taxi. The North airport (Rodeos) is about 20 minutes from Puerto de la Cruz, and the South airport (Reina Sofía) is about 1 hour and 20 minutes away. You must be available in Tenerife for the full period stipulated, and attend and participate throughout to qualify for your credits at the end of the week. and Conditions published on our website. Failure to abide by our T+Cs could result in you being excluded from the course with no refund due, and obliged to make your own arrangements to return home. We are strict on this issue for a very simple reason – our T+Cs are designed for your safety and to maximise learning potential for everyone on the course. GeoTenerife is an ABTA member, so your booking is fully protected. Places will be allocated on a first-come, first-served basis and we have a maximum of just 40 places available. Payment in full is required to book, and your place will not be confirmed until your payment has cleared. Fee includes all tuition, field trips, 8 nights’ half-board, shared accommodation (21-29 March) and coffee breaks. You may, of course, leave after 18:00 on 28 March if you prefer, but no reduction will be made on the inscription price if you stay one less night. Supper will be included on 21 March for those arriving at the hotel by 18:00. The organization will offer scholarships to attend this training course. The GeoTenerife scholarships (900 €) are promoted by GeoTenerife Ltd. and INVOLCAN (1 for every 20 places booked) and will cover the registration fee (650 €) plus a stipend of 250 € towards flights and/or other incidentals. The ULL scholarships (4) are promoted by ULL and INVOLCAN and will be offered to ULL students, covering 50% of the registration fee. The INVOLCAN scholarship (1) is devoted to students from Cape Verde and will offer free registration, roundtrip air ticket, housing and food expenses. In order to apply for a GeoTenerife scholarship, please send an email to enquiries@geotenerife.com and write 2018 VM GeoTenerife Scholar in the subject line of your application. Please send a cover letter outlining why you deserve a Geotenerife Scholarship and an academic CV to support your application [more information below]. In order to apply for a ULL scholarship, please send an email to ldauria@iter.es and write 2018 VM ULL Scholar in the subject line of your application. Please send a cover letter outlining why you deserve a ULL Scholarship and an academic CV to support your application. In order to apply for a INVOLCAN scholarship, please send an email to ldauria@iter.es and write 2018 VM INVOLCAN Scholar in the subject line of your application. Please send a cover letter outlining why you deserve a INVOLCAN Scholarship and an academic CV to support your application. We are passionate about enabling access to our programmes to talented scientists. For 2018, we are pleased to launch the GeoTenerife Scholar programme, run in conjunction with INVOLCAN. The programme will offer one scholarship to the value of €900 for every 20 places booked. A scholarship covers full cost of a field school place plus a stipend of €250 towards flights and/or other incidentals. Please note a field school place includes eight nights’ half board accommodation plus coffee breaks, field trips, etc. In order to apply for a scholarship place, please send an email to enquiries@geotenerife.com and write 2018 VM Scholar in the subject line of your application. Please send a cover letter outlining why you deserve a Scholarship place and an academic CV to support your application. The stipend will be paid on arrival. We regret we cannot make advance payments. Want to see what our Scholars get up to?